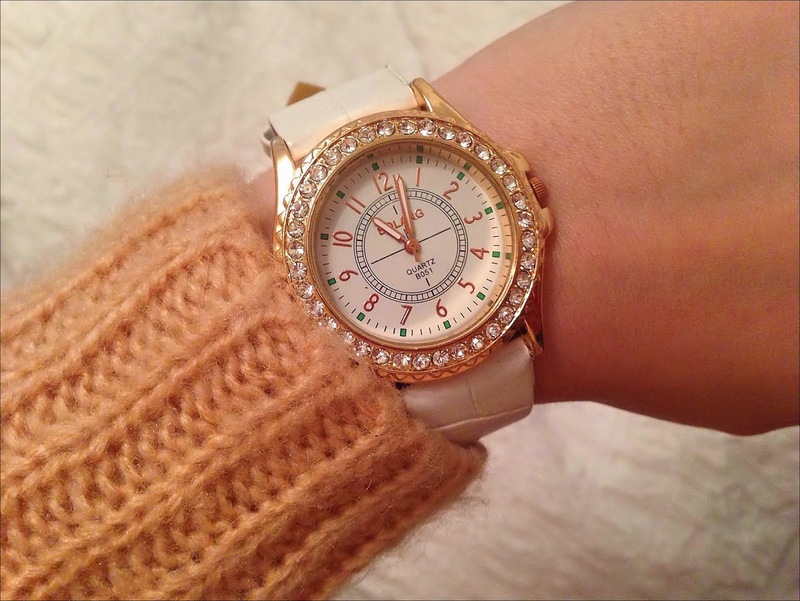 A wrist watch is a popular fashion accessory but finding one that’s both fashionable and affordable can be a challenge. Often a watch can also be a collectable as there are so many different styles on the market people often like to have a few and swap them depending on their outfit. This isn’t something I personally do and I’m quite fussy when it comes to watches because I have small wrists so I’m not a fan of anything that looks too big, heavy and chunky. I like a watch which is feminine, smart, sophisticated and goes with a whole host of outfits whether they be for day or evening. One of my favourite women’s watches at the moment is this gorgeous white leather quartz analog wrist watch from Born Pretty. The strap of this watch has a texture which adds dimension and the material is soft so it is comfortable to wear. This watch features a large clock face but because of the contrasting colours and gorgeous rhinestones that outline the edge I don’t find it to be overpowering when wearing it on my wrist. Instead, I think it works perfectly. 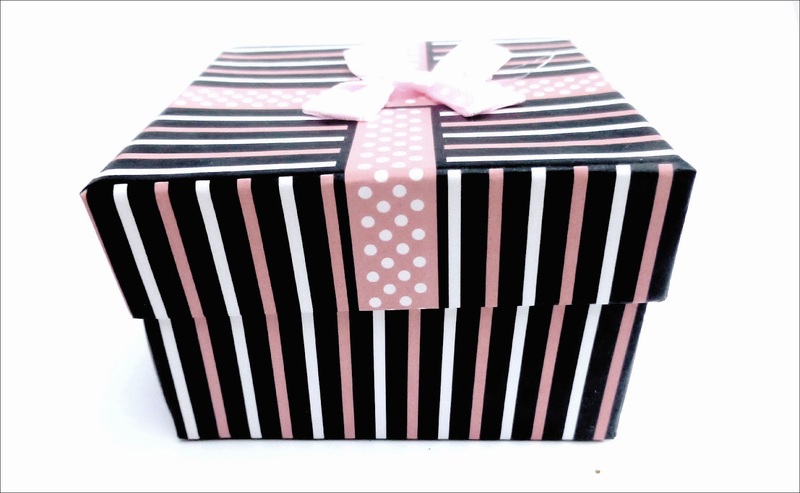 The packaging is also adorable because the watch comes is a in box designed like a present so this watch would also make a lovely gift for someone. I love this watch, it is gorgeous and can be worn all year round as it looks pretty with summer dresses because of the light, fresh colours but also goes well with jumpers in Winter. 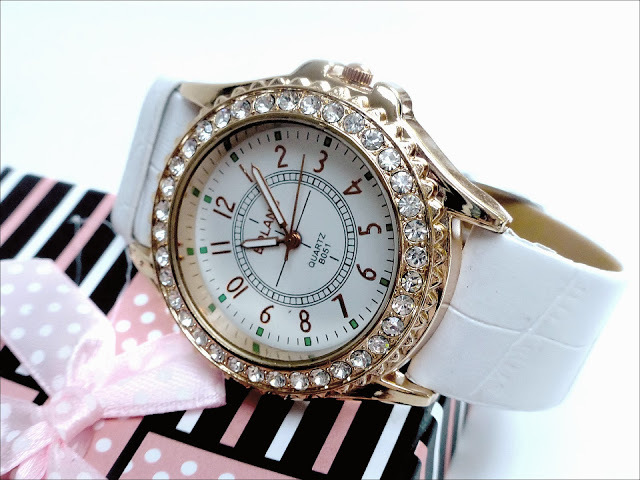 You can check out this watch and more such as bracelet watches, LED watches on the Born Pretty store here. They also sell a lot of other lovely products. If you quote the code KIMBERC10 you will also receive a 10% discount! ooo ^^ that is one PRETTY watch! ^^ lucky you!